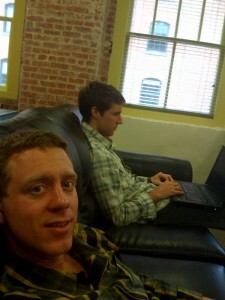 John started SwellPath in mid 2008. One of the first companies he reached out to was Tactics, where I was the Director of Online Marketing. I ultimately didn’t hire him to do any work for us (John has learned to sell himself much better since then, and I’ve since realized I was wrong about how much help my paid search program needed), but that was the start of an amazing relationship as friends and business partners. We launched the partnership on January 1st, 2009 and it has been an incredibly successful venture so far. We’ve put together an amazing team that has really advanced the work that we do, and been able to work with incredible clients as a result. John and I have very different personalities, but always manage to get on the same page and work towards the same goals. That unified vision has led to John’s departure from SwellPath. He’ll be running Measureful now, a new company that was ideated within the walls of SwellPath. Measureful will be the manifestation of over a year’s worth of ideation and development, with the goal of creating a truly unique new digital analytics experience. It’s interesting how much you forget when you reflect on the evolution of an idea. I’m pretty sure we started out with the intention of creating internal reporting efficiencies at SwellPath, but it eventually morphed into trying to machine and automate digital analysis, for companies that can’t afford a SwellPath, or want additional analysis tools. The problem Measureful is solving is really nothing new: digital analytics is invaluable, but it is time consuming, confusing, and daunting. Measureful will be part of Upstart Labs for the next several months. No doubt Measureful will continue to morph as John moves through customer development and fine-tunes it. I speak on behalf of the SwellPath team, our clients, and the friends and family that have been impacted by what has been accomplished here, when I express the immense amount of gratitude that John is worthy of. I personally am indebted to John for having the most significant impact on my career and personal growth, of anyone I’ve ever worked with. This decision came with heavy mixed emotions; but I’m going to be on the board at Measureful, and John will maintain some ownership in SwellPath, so our journeys will continue to be intertwined. That being said, we’re both looking forward to proving that we can accomplish the same level of growth and success we’ve been able to accomplish at SwellPath, on our own. Be sure to sign up for updates on Measureful. This entry was posted in news on July 26, 2012 by Adam. Your foos skills are going to get rusty until you get your own space.